It all took off for Keb’ Mo’ in 1994 with his self-titled release, and over the years he has proven that he is a musical force that defies typical genre labels. Album after album, 14 in total, have garnered him 4 GRAMMY awards and 11 GRAMMY nominations, including Country Song of the Year for “I Hope,” co-written with The Dixie Chicks, and 3 alone for his 2014 self-produced release, BLUESAmericana including Americana Album of the Year. Keb’ has also been awarded 11 Blues Foundation Awards and 6 BMI Awards for his work in TV & Film. Over the past two decades, Keb’ has cultivated a reputation as a modern master of American roots music through the understated excellence of his live and studio performances. Artists who have recorded his songs include B.B. King, Buddy Guy, the Dixie Chicks, Joe Cocker, Robert Palmer, Tom Jones, Melissa Manchester, Solomon Burke and the Zac Brown Band to name a few. The list of artist collaborations comprises a who’s who in the music industry and includes Bonnie Raitt, Taj Mahal, Vince Gill, Amy Grant, Jackson Browne, Natalie Cole, Lyle Lovett, India Arie, James Cotton, Bobby Rush, Timothy B. Schmit, Marcus Miller and many more. Add to this his TV and movie appearances, including playing his iconic version of “America The Beautiful” in the series finale of West Wing as well as at the actual White House for President Obama; and his long-time support for not-for-profit organizations such as Playing for Change, Vote For Change, the No Nukes Group and Kennedy Center’s Turnaround Arts Program where he mentors youth through music. If it was at all possible to measure success, it must be Keb’ Mo’s biography. The Compton-born blueseman, now a Nashville resident, whose career spans less than 30 years is cherished by fans internationally for his rich, distinctive voice spinning humorous and passionate stories over a guitar prowess that inspired Gibson to release the Keb Mo Bluesmaster acoustic guitar. 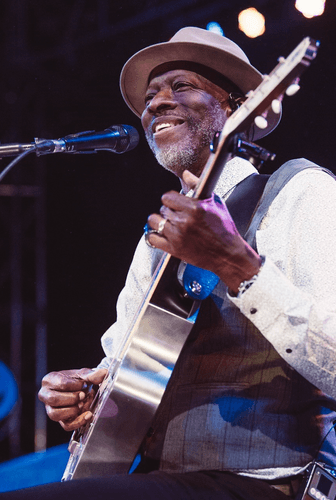 Keb’ Mo’ will perform a handful of must-see solo performances along the east coast of Australia as well as returning as a crowd favourite to celebrate the 30th anniversary of Bluesfest, Byron Bay.